We offer a delivery service that's same day, next day and Saturday. With fully stocked depots across London we get many deliveries out on the same day, and if it’s too late to reach you we will fulfil the order first thing the next day. Orders placed before 5pm on a Friday can be delivered to you before midday on Saturday morning. All deliveries within the M25 are free, deliveries outside of that area or outside of standard working hours may be subject to charge. 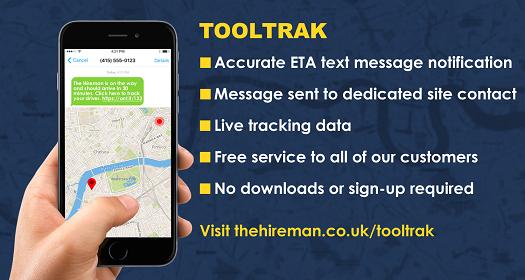 ToolTrak is The Hireman's driver tracking service. All you need to do is place an order and ToolTrak will do the rest. Once our driver is en-route you'll receive a text from us giving you an ETA and a link to track the driver's progress. Clicking on the link opens a map on your mobile device with the driver's location and his ETA. From here you can follow the driver's progress as well as having access to information about the driver and vehicle. ToolTrak has been in operation since 2017 and feedback on this service has been universally positive from our customers, as well as from our hire controllers and depot managers. ToolTrak allows our customers to leave anonymous feedback and we are pleased to see an average rating of 4.8 out of 5 since the service was launched.